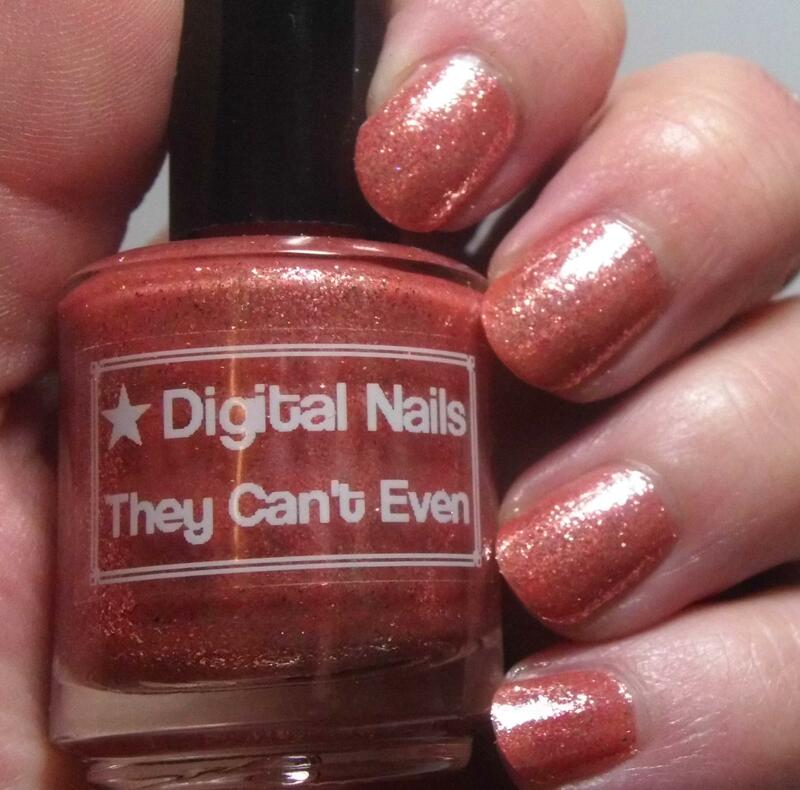 Digital Nails – “The Walking Dad” Trio! I have such a fun collection for you today readers! We all know my love of Digital Nails, The Walking Dead, and nail polish. What you may not know is that I love a good corny pun/joke as well. There is a well-established internet meme phenomenon wherein Rick from The Walking Dead is featured in meme’s telling an apparently long-suffering “Coral” (seriously listen to the show sometime, when Rick is hollering for Carl it totally sounds like Coral!) some horrible and yet somehow hilarious “dad” jokes. So, Digital Nails apparently also enjoys these because she released a gorgeous trio of coral (hahaha) polishes based on “The Walking Dad.” When I saw them I knew I had to have them because of all of the reasons above. Plus, they are just downright gorgeous. You ready? Let’s get started! 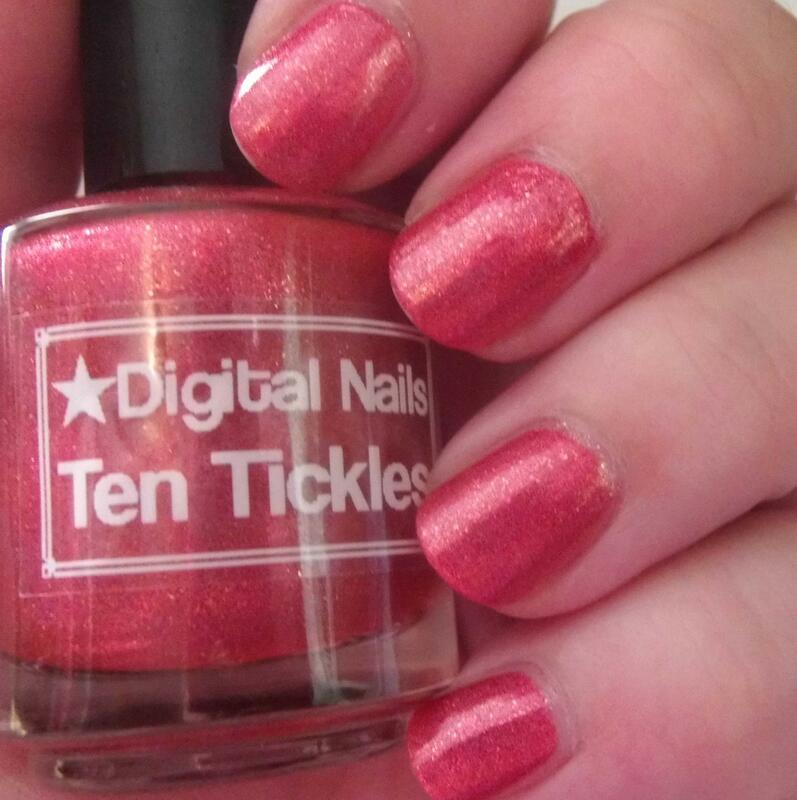 Ten Tickles is a hot coral holographic polish with gorgeous rose-gold microflakies. I am totally in love with this color and I wore it (with some nail art which I will show you later) and it was very well-received by my friends and family! In this lighting you can see the flakies, so even if the sun isn’t out to play with all the holographic goodness there is still some stuff going on. Plus, you all know that the more interesting and complex the holo, the better I like it! The formula on this was perfection. It went on very easily without any mishaps or issues whatsoever. This is definitely a must-have for any collection. Pictures show two coats plus topcoat. I’ll admit this one made me giggle but not as much as the next one! He Doesn’t Carrot All is a pale coral creme with a lovely green flash of shimmer. Formula on this one was utterly perfect. I mean it’s everything I would expect from a creme-based polish. No leveling issues, did not drag or streak. Pictures show two coats plus topcoat. Just…oh.em.gee. This polish is so stunning. It’s my favorite because of the color and the name though! 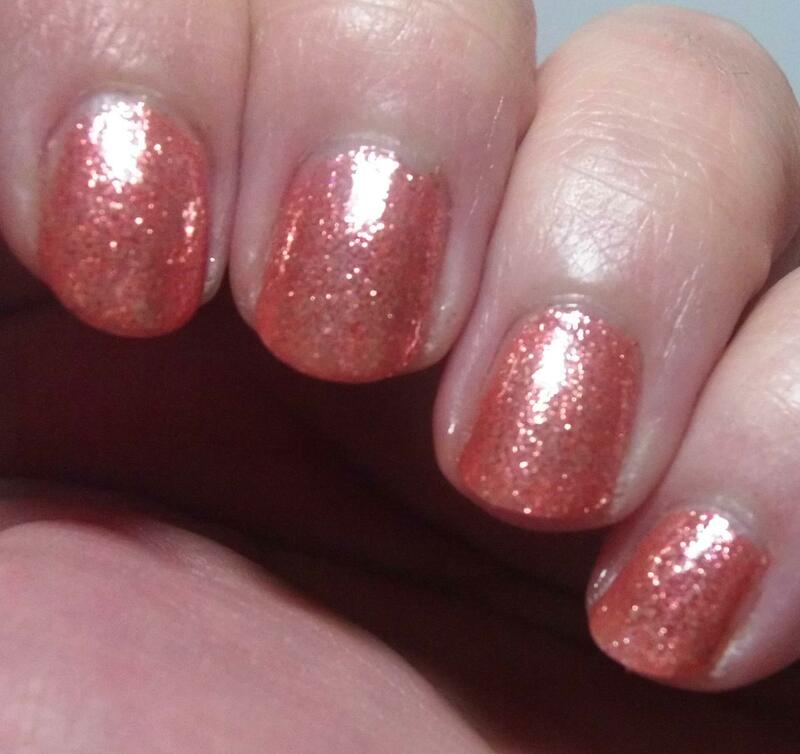 This is more of an orangey-coral base packed to the brim with silver flakies. 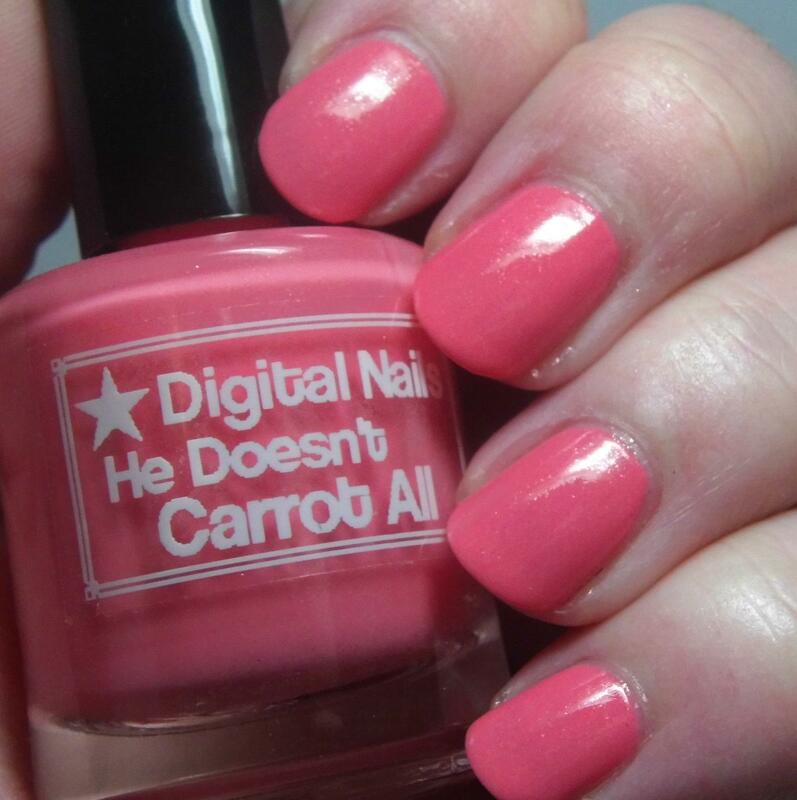 The joke for this polish is: “Why do teenaged girls walk in groups of three, Coral? Because they can’t even! They can’t even, Coral!” I’m right there with those teenaged girls because I can’t even with this color! I’m telling you this color has moved up into my top echelon of all time favorite polishes. It just gets prettier and prettier every time I look at it! I had no problems with application at all. The only thing I will say is that those gorgeous flakies are very tenacious if they get on your cuticles so you’ll want to apply carefully to avoid too much clean up. Pictures show two coats plus topcoat. Seriously, look at that! I can’t even. I just can’t even! OH I promised nail art didn’t I…well ok! I started with Ten Tickles then did a little reverse stamping. I used MoYou London – Pro 13 for the image and filled in the flowers with He Doesn’t Carrot All. This is just simply They Can’t Even stamped with a cute swirly image from the Cici & Sisi Christmas 2015 plate. There you have it a gorgeous collection! 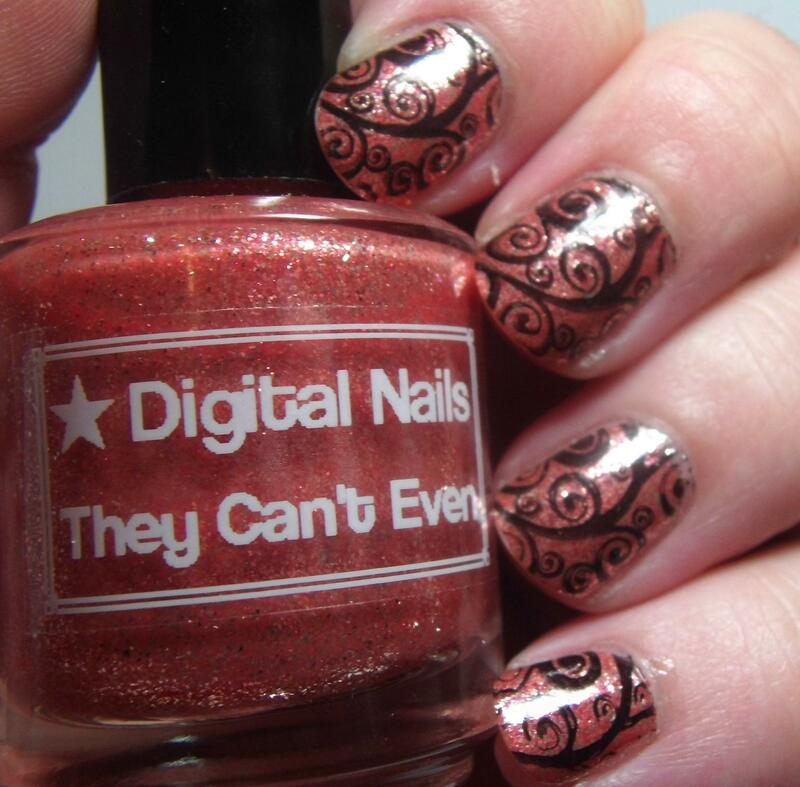 You can check out Digital Nails at the links below. I highly recommend following them on Facebook and Instagram. This is going to be a quickie Wednesdays We Wear Pink post! I didn’t want to leave ya’ll wishing for a manicure revolving around one of the most awesome colors on the planet! I also have some exciting stuff coming up in the next few days so keep your eyes peeled for that! 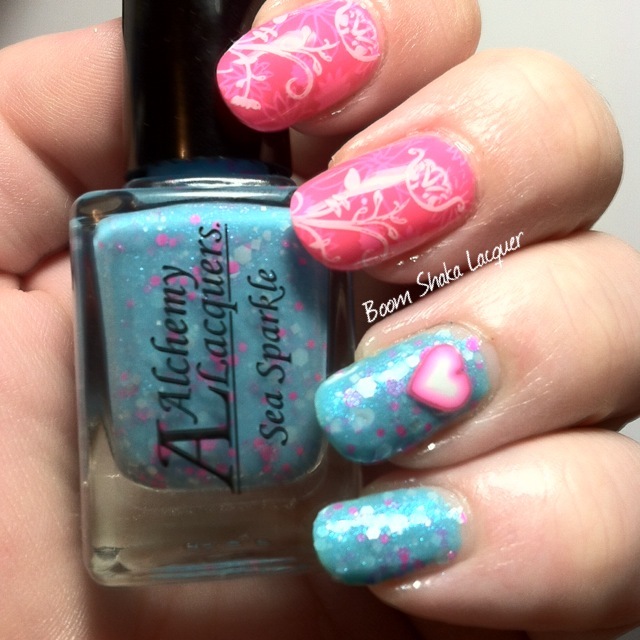 Today I’m showing you a manicure I did using some Alchemy Lacquers, stamping, and jelly polishes! How much fun is that? Oh yes and some polymer clay slices because I clearly don’t know how to leave things alone! So here I added another stamp on the top of the jelly stampwich off of the Pro – 13 plate and a cute little polymer clay heart! I loved everything about this mani – it’s over the top, it’s girly, and it’s PINK! Here’s another shot of the finished mani! I really liked the China Glaze for the jelly stampwich though I wish I had a more opaque white so that it showed through a bit better! 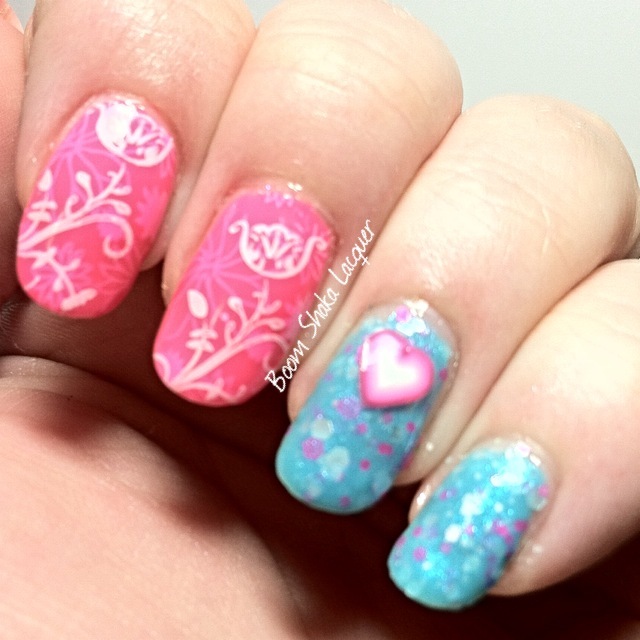 This entry was posted on July 16, 2014, in Alchemy Lacquers, MoYou London, Nail Art, Nail Stamping, Wednesdays We Wear Pink. Wednesdays We Wear Pink! Featuring some Nail Stamping! This will be a kind of quick post for today’s pink post! 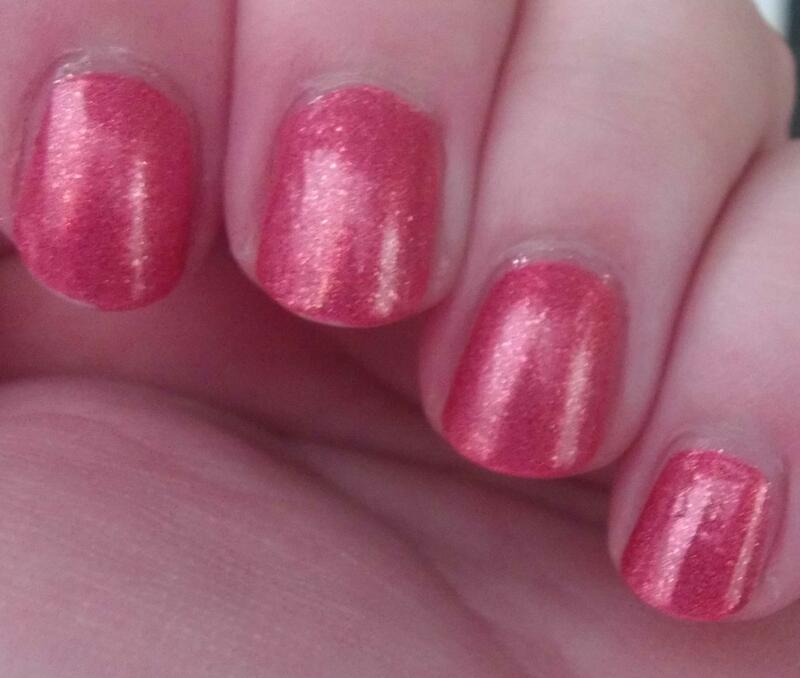 I decided that I wanted to use an amazing polish that I had languishing in my collection for today’s post. It’s a stunner really! So let’s get on with it! 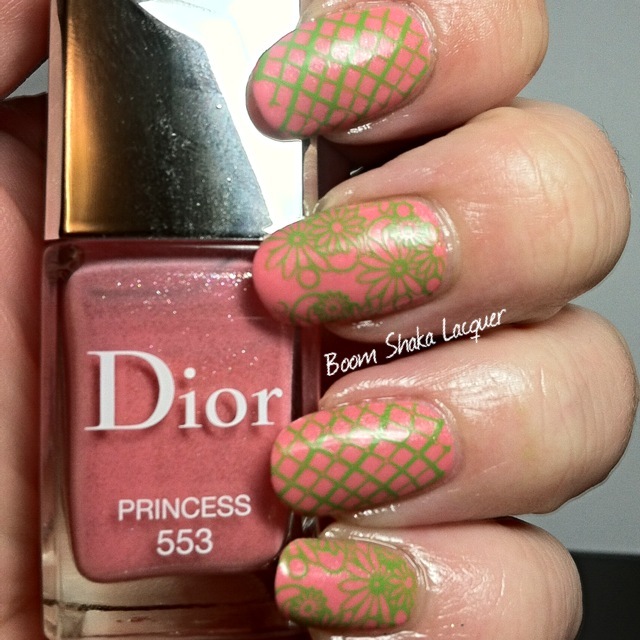 For today’s manicure I paired up Dior – Princess with some lime green stamping! Now…as you can see by the bottle, this is a pink polish. 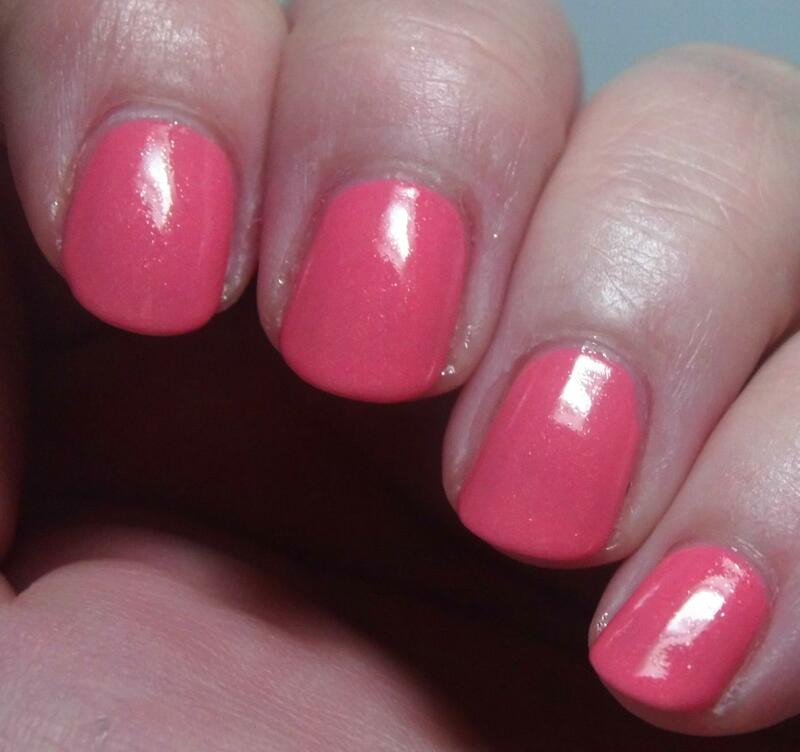 However it is a slightly coral leaning pink and when I layered the Sally Hansen – Just in Lime over it it was far more coral looking than pink! 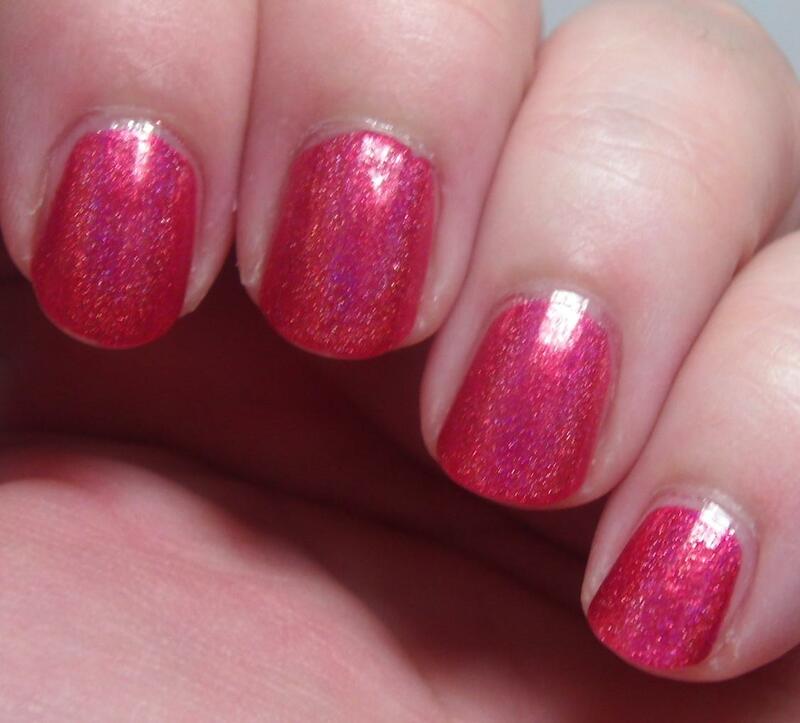 Dior – Princess is a beautiful coral leaning princess pink polish packed with a silvery shimmer. First I started with two thin coats of Dior – Princess. There is a reason that these high-end polishes are high-end too. Easily one of the best formulas I have ever worked with on a nail polish. Plus the brush is really awesome, kind of squatty but wide and it’s very easy to work with! 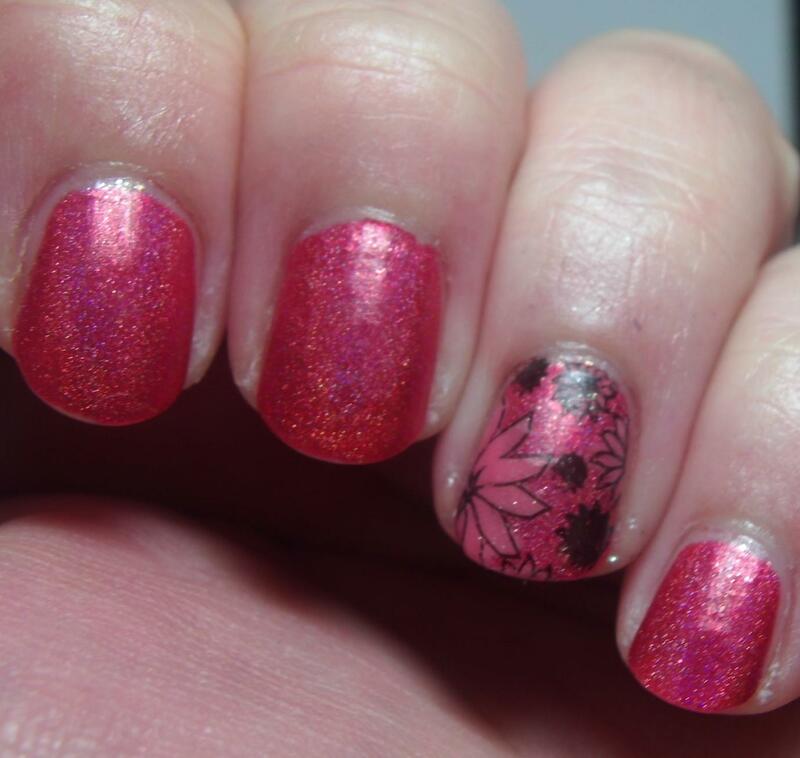 I then used stamps from Cheeky and MoYou London to create the stamped design. I got so many compliments on this mani as I was out and about running errands! Products used: Sally Hansen – Complete Care 4-in-1 Treatment; Dior – Princess; Sally Hansen – Just in Lime; Digital Nails – Ain’t Nobody Got Time for That; Cheeky Plate – CH44; MoYou London Plate – Pro 01. You can find out information about the products at the following sites. Dior polishes are available in department stores and various online retailers. Sally Hansen Insta-Dri polishes are available at all kinds of drugstores, big box stores, and grocery stores across the country and are great for stamping! This entry was posted on July 2, 2014, in Cheeky, MoYou London, Nail Art, Nail Stamping, Wednesdays We Wear Pink. I’m Back and Ready to Rock! Hello my lovely readers. I am so heartbroken that I’ve been away from you for so long! I successfully finished the semester and I have just two more to go before I have my Bachelor’s Degree – I’m quite excited about that! Then I will go on to grad school but it will be such a sense of accomplishment to have that degree! I have also had a few health problems but I’m not letting them keep me down so let’s not dwell! I’m here now and I want to rock some cute nails! Actually let me reword that last sentence..I didn’t let life keep me from rocking some cute nails. So I have some of my nail art looks that I was really happy with over the past several weeks that I wanted to share with you. I’ve reviewed most of these polishes before and you know I’ll link you up in case you missed it! First I’m going to show you a lovely Pipe Dream Polish with some nail art stamping (Actually not stamping, it’s been a few weeks and I had a brain fart) – now this polish was actually on loan to me from a friend. 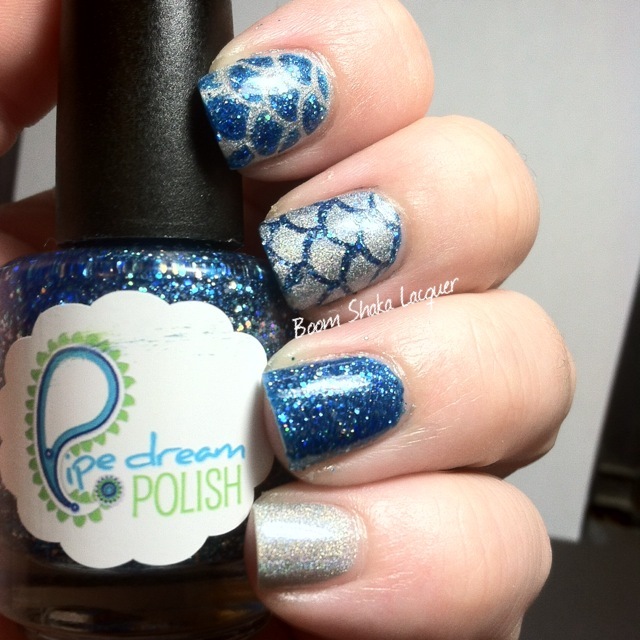 I had never tried Pipe Dream Polish before but wowzers what a blue marvel this one was! Pipe Dream Polish – Rhythm and Blues is a deep blue jelly filled to the brim with holographic glitters. They just sparkle like crazy! I decided to pair it with Butter London – Dodgy Barnett. I’m so sorry I reported that I stamped this mani. I think I’ve gone completely crazy – I did TRY to stamp this one but Dodgy Barnett was too sheer for that. 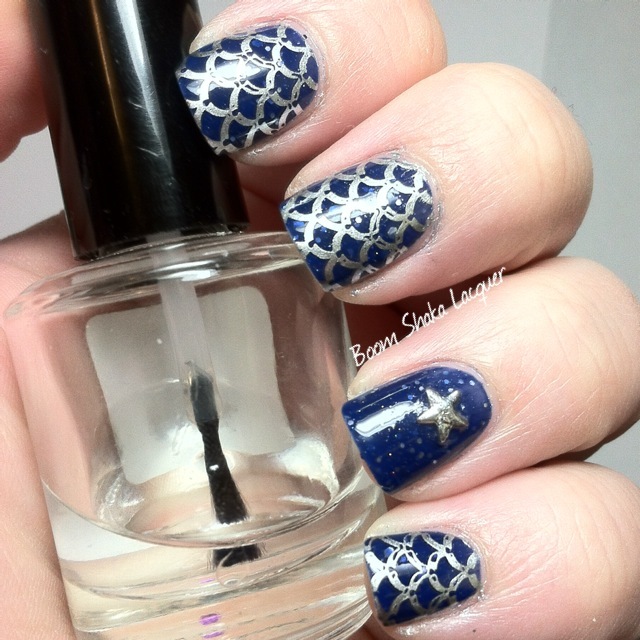 I ended up using for THIS mani Love, Angeline Nail Shields in the mermaid scale pattern. They work like a charm and are super easy! You can either just stick them on and trim to your nail OR you can use them as a mask (as I did here) and place them on your nail, paint over with the opposite color than the base, then while the polish is STILL WET remove carefully. It’s important to do this when the base color is completely dry and the color you paint over the nail shield is wet to assure best results. Next up I have a mani that I really adored! One of my favorites of the Alchemy Lacquer’s Spring Shimmer Crellies was the most unlikely since I’m usually a blue/teal/green girl and that was Nasturtium which I reviewed here. Some of the glitters in Nasturtium EXACTLY matched Aly’s Dream Polish – Spicy Sriracha which I reviewed here. I first painted my middle, ring, and pinky fingers with Alchemy Lacquers – Nasturtium and then I painted the fore finger with Aly’s Dream Polish – Spicy Sriracha. I then stamped my “communication” finger with Spicy Sriracha using MoYou London plate Sailor – 04. I topped off the ring and pinky fingers with some cute little golden hex studs from Winstonia. A word about MoYou London plates…AWESOMESAUCE. Is that word enough for you? I could go on and on. I’m hoping I’ll be able to acquire some more plates and really experiment with them and I assure you I’ll be sharing those results with you! 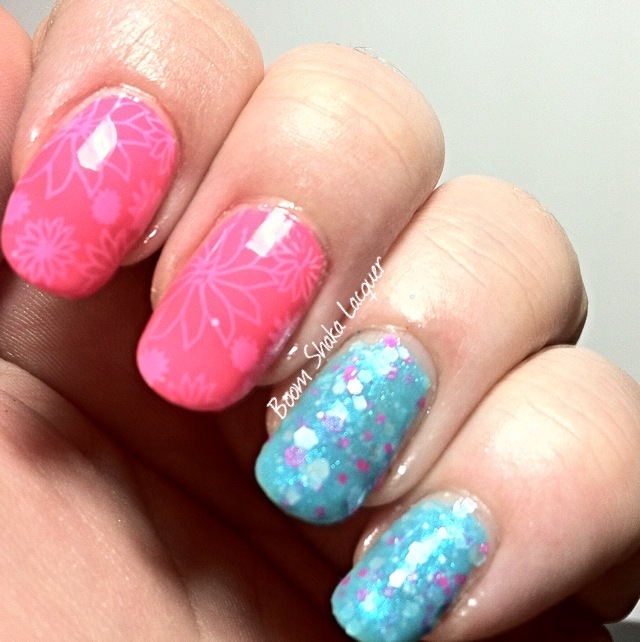 Last but not least I have another nail art stamping look to show you! I know I’ve mentioned before that this polish is the most TARDIS blue polish I have even though it’s based on the Sherlock fandom. That’s ok I’m an equal opportunity fangirl so it works for me. This is A Study in Polish – Not Our Division which is just so great and I have reviewed it right here! I stamped with Sally Hansen – Silver Sweep using MoYou London plate Pro – 01. I got a little excited with the pressure on the stamping that’s why it looks more like an outline in places but I’m still trying to get really good at stamping and sometimes it’s not a total win. I still ADORED this mani and got so many compliments on it! I added a cute little Winstonia star stud (because, STARS) on my ring finger to finish off the whole look. There you have it some of the nail art I’ve been doing. I’ve done some plain manis too of course, I don’t keep anything on too long but I was really pleased with these. I do have some new swatches and reviews coming up and I have heard some whispers about the new Alchemy Lacquers summer line. This entry was posted on May 22, 2014, in A Study in Polish, Alchemy Lacquers, Aly's Dream Polish, Indie Polish, Love, Angeline, MoYou London, Nail Art, Nail Stamping, Pipe Dream Polish.